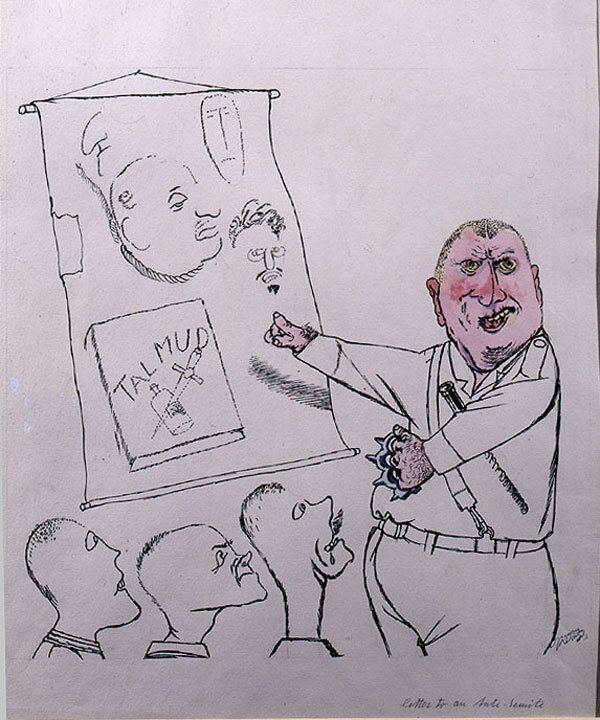 By 1938 the satirical artist George Grosz was in exile in New York, having fled in 1933, only days before Hitler’s accession to power in order to escape prosecution. Grosz had trained at the Dresden Academy and later at the school of the Museum of Decorative Arts in Berlin, but was also greatly influenced by graphic artists including William Hogarth and Honore Daumier and by popular art forms including graffiti. From 1916 he began to paint in oils and his lithographs featured regularly in books and magazines. He served twice during the First World War (the first time as a volunteer), and was twice discharged for medical reasons. This experience only sharpened his political conscience resulting in a series of bitingly satirical works that were particularly critical of militarism, corruption and hypocrisy. A prominent member of the Dada movement, he also became the leading exponent of the Neue Sachlichkeit (New Objectivity) movement and established an international reputation that led to the invitation to teach in New York. In 1937 Grosz’s work was included, in his absence, in the infamous 1937 ‘Degenerate Art’ exhibition that opened in Munich before touring throughout Germany and Austria. He became a naturalised American citizen in 1938 and published his autobiography, A Little Yes and a Big No in New York in 1946, but, disillusioned with the ‘American Dream’, he returned to postwar Berlin in 1959 and died shortly afterwards. 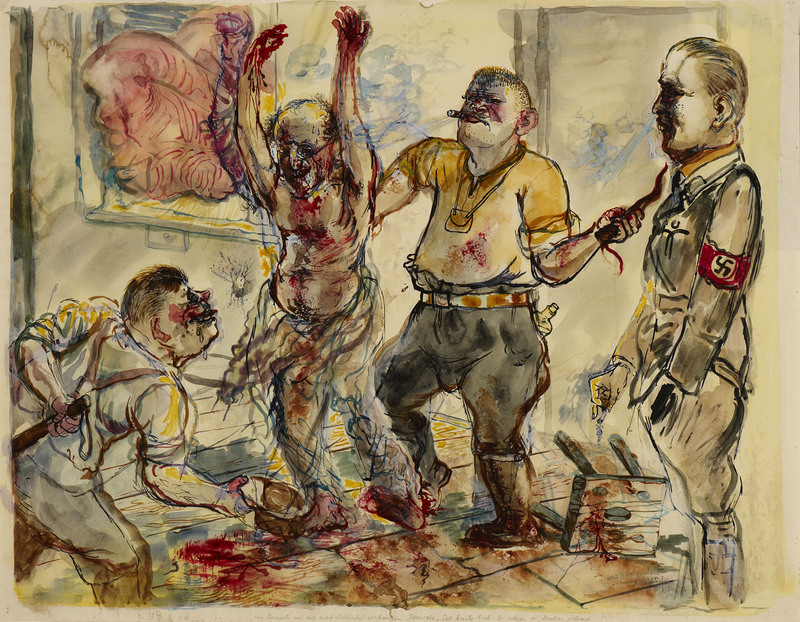 'Interrogation' is the second of the two works in the Ben Uri collection referencing the murder of Grosz’s friend, the writer and anarchist Erich Mühsam, the artist depicts the scene with characteristic savagery underlined by the casually brutal attitude of the torturers and the free-flowing blood. An inscription beneath this image in Berlin dialect reads: 'un kannste uns ma wat komisches vortanzen Jenosse, det haste doch so scheen in Moskau jelernt' ('And, can't you dance something entertaining for us comrade, you learned this so beautifully in Moscow, indeed'), referring satirically to Mühsam's communism. 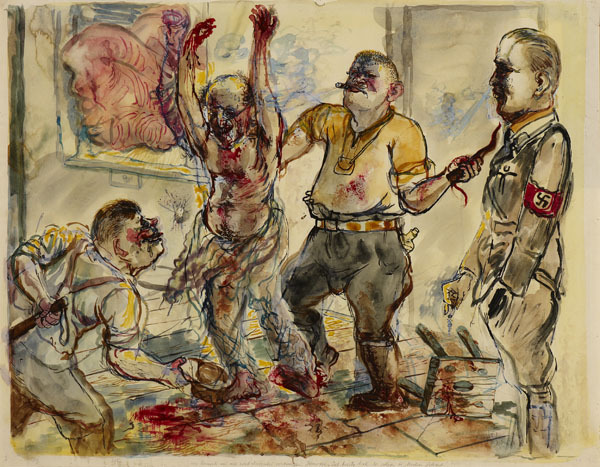 The drawing also relates thematically and compositionally to a number of Grosz’s works from the 1930s, including 'After the Questioning' (also known as 'They Couldn’t Get Anything More Out of Him', a watercolour in which a prisoner is shown being dragged from a room). It may also reference the experience of another friend, Dr. Hans Borchardt, who had been imprisoned in Dachau and Sachsenhausen before escaping. The German-American philosopher Hannah Arendt later observed that Grosz’s cartoons ‘seemed to us not satires but realistic reportage: we knew those types, they were all around us’. The composition and iconography also invoke comparison with Piero della Francesca’s 'Flagellation of Christ', underlining Mühsam’s martyrdom. Yet although his face is recognizable in a number of these works, Mühsam’s name never appears: as Juergin M Judin has observed, ‘For him, the fate of Erich Mühsam represented the fate of all victims of the Nazi regime’. Both these works are part of a larger disturbing series commemorating the writer, five of which (including a version of 'Interrogation') were included in Grosz’s final political portfolio, 'Interregnum', published in America in 1936. In 1937 Grosz’s work was included, in his absence, in the infamous 1937 ‘Degenerate Art’ exhibition that opened in Munich before touring throughout Germany and Austria. This work, together with its companion piece, was unveiled at a special ceremony at Ben Uri on 30 January 2013 marking the 80th anniversary of Hitler’s accession to the Chancellorship of Germany and the donation to the museum of The Lecture by Sally, Richard and Andrew Kalman in memory of their late father, Andras Kalman (1919–2007), a Hungarian émigré who came to the UK to study in 1939, later founding the Crane Calman Gallery, and whose own immediate family perished in the Holocaust.